For those of you who have a plan a vacation to Bali along with Your beloved family, make sure that you do not forget to visit the Bali Bird Park as an alternative place of your holiday in Bali. Surely your family especially your kids will be thrilled when you are invited to visit the Bali Bird Park. The location of the Bali Bird Park is near the area of Ubud, Bali is so very right for anyone to visit a moment in the Bali Bird Park. True to its name, the Bali Bird Park is a special garden area which was built as a place of conservation of various species of birds that come from many different places. All kinds of birds in Indonesia live free and well-maintained in the Bali Bird Park. Bali Bird Park also had several collections of birds from outside of Indonesia as a rare bird species from Latin America and Africa. The total number of species of birds collection dikonservasi in Bali Bird Park, this is about 1000 from creeping thing with 250 different species/type. From the Bali Bird Park is about 2 acres so judged large enough to serve as a conservation Park hundreds of species of rare birds. If you are as well as your kids on vacation to Bali Bird Park is certainly going to be a very interesting experience for the fruit of your heart. Not only as a medium of entertainment for all tourists visiting Bali Bird Park, but also the Bali Bird Park can also serve as media is educational for anyone visiting besedia in the bird park located on the island of Bali. 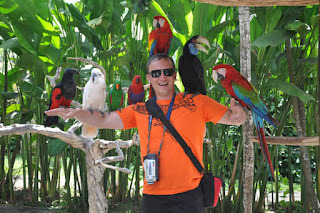 Bali Bird Park, it teaches us all that we are obliged to maintain the sustainability of the bird. Other functions of the Bali Bird Park is as a place for the reproduction of rare bird species in the world. One of the supporting facilities of the program of preservation and reproduction of species of birds, the local Government of Bali worked with the tour organizer in Bali had a program of planting more than 2000 species of plants were built several years before the Bali Bird Park. There are about 50 plants Palm who deliberately planted to attract butterflies in order to come back to the Bali Bird Park. As the appeal of this bird park, the tour manager also offers a wide range of attractions the clever birds that are already getting special training of trainers of professional bird. Sounds very interesting, isn't it? You must visit tourist sites this one. A guide will accompany each of the groups of tourists visiting Bali Bird Park. So when you are hard to guess what kinds of birds are before you, your guide will explain it in detail.